The damages caused by insects are often much less severe in adequately watered lawns. Insects that attack residential lawns are generally difficult to detect and, usually, their presence is not known until significant damage has occurred. The damage may be mistaken for the aftermath of a drought. If the lawn remains brown and continues to deteriorate despite proper watering, examine thoroughly to determine if it is an insect infestation. Regular inspection of grass stems, roots, thatch and soil will allow you to better determine if you are dealing with an insect problem and therefore, allow you to limit potential damages. Presence of brownish irregular patches on the lawn, often accompanied by sections of grass that have been overturned or torn-up by racoons, moles or skunks. Early-spring as well as late-summer and early-autumn. 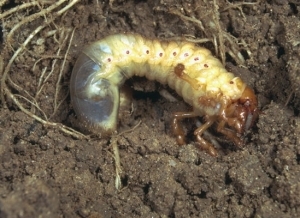 White Grubs, which are beetle grub larvae that later transform into what is commonly known as the June bug. You will be able to effortlessly lift patches of grass, without any root resistance. Underneath these patches, you will find c-shaped white larvae. Do not use outdoor lighting on your property whenever possible during the egg-laying period (mid-June to mid-July) because the light will attract the beetle (June bug). You may choose to apply nematodes (microscopic worms) during the months of May and August when the temperature of the soil is ideal. There is also an effective insecticide that controls white grub. Irregular-shaped, dry yellow patches that spread rapidly. Mid-summer during hot and dry periods, typically late-June to late-July. Lawn damage shows up as irregular yellow patches, which begin in late-June and spread over the summer, even if the lawn is watered regularly. They start off a bright red and then darken to orange or brown, finally to black with a white band across the back when fully mature. They are approximately ¼ inch in size. Look for them in the greener parts of the lawn, near damaged areas. 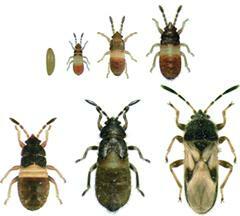 The adult chinch bug does virtually no damage. Apply soapy water morning and evening. Repeat for 5-7 days. In case of a major infestation, an insecticide is required. Presence of irregular yellowish-brown patches on the lawn. The early visible signs are reminiscent of the damage caused by white grub. With sod webworms, however, you will notice patches of lifeless grass that easily detach from the soil, revealing silken masses to which particles of soil and green-coloured excretions will adhere. The silk is produced by the sod webworm caterpillar, a 2 cm long insect with a dark brown head and slightly hairy whitish-coloured body. In late May or early June until August, you will notice the presence of small whitish nocturnal moths near the surface of the lawn. This is a sign of a possible infestation, of which damages are likely to appear in autumn. A thick healthy lawn can withstand the presence of a considerable number of sod webworms without suffering. Formation of sand or soil mounds that can become a nuisance when mowing or walking on the lawn. Ants. When building mounds, ants chew through plant roots and excavate large labyrinths of pathways and chambers underneath the earth’s surface. These tunnels cause rapid drainage of the soil’s moisture. When the roots are destroyed, grass blades cannot absorb moisture. The result of these damages is a dry lawn surface. Reddish-coloured dry patches will appear. You will also notice the appearance of sandy mounds. In addition, because this area is sparse and weak, weeds have a tendency to spread easily. 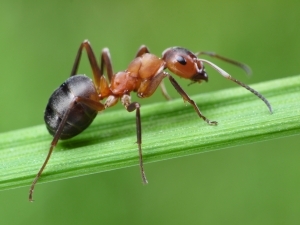 Use ant traps or any insecticide product available on the market. You may also choose to call upon a qualified and certified exterminator. Formation of mounds of soil, 2 inches in circumference, approximately 1 inch thick, on the lawn surface that can become a nuisance when mowing or walking on the lawn. All throughout the season, especially during the rainy periods in spring and autumn. 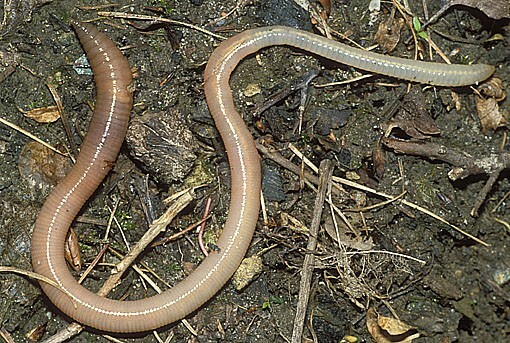 Earthworms are fossorial organisms, meaning that they are adapted to digging and life underground. These tunnels allow water and air to circulate within the soil. It provides the best aeration possible. 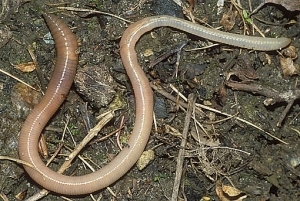 During an abundant rainfall, the earthworm will emerge so as not to drown within the tunnels, which can cause mounds of soil on the surface of the lawn. Water the lawn and flatten with a lawn roller. Do not destroy the earthworms.